General Prayut’s power may be unlimited on paper, but in reality he is curtailed on several fronts. Since Thailand’s military displaced a democratically elected government in 2014, the country has been ruled arbitrarily by a junta fronted by old-time strongman General Prayut Chan-o-cha. The junta governed using martial law for a period of ten months before invoking a special clause in their interim constitution which was designed to keep Thai society under the jackboot. Article 44 of the constitution — often dubbed “the dictator’s law” by its critics — retained many of the prerogatives of martial law, giving the military sweeping powers which it has used to silence opposition and push through reforms. And Prayut is not shy in reminding people of his authority. During press conferences, the general often points to the absolute power he wields, even famously ‘joking’ that he could have members of the press executed if they did not toe the line. But he also claims that he chooses not to use the unlimited power at his disposal, portraying himself as a wise and benevolent dictator who thinks only of the greater good. However, these press events have become notorious due to Prayut’s erratic behavior, which often leaves the dictator looking foolish, weak, and isolated. Standing alone fielding questions from a crowd of journalists seems unbecoming of an all-powerful military strongman and when the questions upset him, the general’s response is more petulant than commanding. “Why don’t you cooperate with me?” he bemoans. “Please understand me,” he beseeches. Despite countless tirades, tantrums, and fists banged on podiums, even the meek Thai media seem unperturbed and press him with further questions. The sessions often end with Prayut storming out of the conference in a sulk. Things are not going well for the junta and Prayut is showing signs of the stress. Thais are complaining about a sluggish economy, the country’s international standing has plummeted, and the opposition is growing bolder. There are indications that his support networks may be turning against him and the draft constitution he backs may struggle to pass the referendum in August. Prayut’s outbursts, although directed at the media, often seem like an internal dialogue in which he wonders aloud: “I’m supposed to have absolute power, so why is everything so difficult?” What the general is slowly finding out is that running a country is more complex than commanding a military unit. One of the problems Prayut faces is that so much of the population are against him, and he knows it. Around 48 percent of Thais voted for Yingluck Shinawatra’s Pheu Thai government, which he toppled less than three years after it came to power. With such a sizable opposition to the coup, the junta have estimated that squeezing too tightly could provoke a backlash that may be hard to contain. The result has been a mixture of suppression and toleration that has at times made the junta seem rather weak, especially compared to authoritarian regimes elsewhere. Numerous small but high profile protests have been staged since the power-grab and the junta’s response has been mixed. Activists, including students and former members of parliament, have been arrested for peacefully protesting and harassed in unacceptable ways. However, those who have been arrested are usually quickly released, and often demonstrate again soon after. The military is only in power by virtue of its brute force and any sign of frailty will embolden the opposition. The Red Shirts — the movement associated with the Pheu Thai Party and the group Prayut must keep the closest watch on — were subdued for a while following the coup but have recently become active again, testing the limits of what they can get away with. From their headquarters at a cafe and library in the Bangkok suburb of Lad Prao, they have been organizing events, which are drawing steady crowds. The junta is keeping a watchful eye on the movement but so far has done surprisingly little to quell it. Prayut also faces pressure from what would usually be regarded as his support network. Key members of the Democrat Party, who are closely associated with the military, have been criticizing the junta-backed draft constitution in the press. Others from the royal-nationalist camp have come out to criticize the junta too, such as former senator Rosana Tositrakul and Suriyasai Katasila, an activist with the People’s Alliance for Democracy (PAD), which was instrumental in toppling the elected government of Thaksin Shinawatra. What this all signals is not exactly clear. Some Red Shirts dismiss it as a lakorn, or soap opera, played out to save the face of politicians who — contrary to the facts of the past decade — consider themselves liberals who couldn’t publicly endorse such an undemocratic constitution. Others point to a split in the royal-nationalist camp, which would change the dynamic of Thailand’s Red-Yellow divide to one in which three groups now jostle for primacy. In this scenario, the network of Thaksin Shinawatra is pitted against two other factions, one headed by privy councillor Prem Tinsulanonda and the other by former military commander Prawit Wongsuwan, regarded by some as the real power behind Prayut. This apparent in-fighting in the royal-nationalist camp sends confusing signals to Bangkok’s middle classes, many of whom back the military and its regressive reforms. Their support could be easily maintained by stressing the need to rid Thailand of the influence of Thaksin, prevent further conflict in society, and guide the country through the much dreaded succession. All of the above have instilled a perception of existential threat in the minds of some Thais and created conditions ripe for an authoritarian reversal. After all, many of Bangkok’s middle classes supported the People’s Democratic Reform Committee (PDRC), whose street protests seriously weakened the Yingluck government and precipitated the coup against it. The junta is therefore a monster of their making and with PDRC leader Suthep Thaugsuban recently coming out in favor of the constitution draft, many of his supporters are likely to do the same. However, the middle classes in Bangkok are fickle and have turned against military rule before under somewhat similar circumstances in 1992. If the civilian wing of the royal-nationalist movement — comprised of the Democrat Party, bureaucrats, former senators, NGO leaders, academics, etc — were to start a campaign to discredit the junta, the middle-classes may well follow suit and Prayut would be in trouble. Whether this scenario eventuates depends on how deep the supposed rift between the two royal-nationalist factions is. Even Thais who are more focused on local concerns have been causing Prayut problems. In Bangkok, mini-van drivers and market vendors have stubbornly resisted junta orders that impacted on their livelihood. In the northeast of Thailand, villagers have been protesting against a mining project they argue is negatively impacting the environment. In the southern provinces, rubber farmers have protested against falling rubber prices, calling for government assistance. Many of these farmers played an important role in the frontline of the PDRC street protests that brought down the Yingluck government and may have felt entitled to a reward. They got it in January of this year when Prayut ordered government ministries to buy rubber directly from the farmers, effectively subsidizing the industry. The move was an embarrassing loss of face for the junta, which had fiercely criticized the ousted government’s rice pledging scheme. Such criticisms are often not well-received and have on occasion led to nationalist backlashes. In November 2015, around 200 royal-nationalists joined a protest at the U.S. embassy led by controversial PDRC monk, Buddha Issara, to show their disapproval of Ambassador Glyn T. Davies, who had raised concerns about increased use of the country’s lèse–majesté law. Although political gatherings are banned under Article 44, nothing was done to halt the protests. It is unclear whether this signaled tacit approval of the demonstration or whether the junta simply felt powerless to move against the monk and his followers. 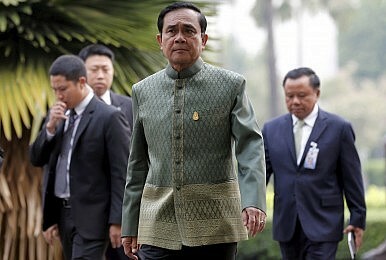 With his outmoded 1950s haircut and mentality to match, General Prayut may look the part of an old-style military strongman, but he seems to lack the requisite power to properly play the role. Despite having unlimited authority on paper in the shape of Article 44, he is curtailed on several fronts. On one side, dealing with the pro-Thaksin forces requires a delicate balancing act of repression and toleration. Misjudging in either direction could play into their hands and make them stronger. On the other, he may be unsure to what extent he can rely on his own support networks. If the rumors of a split in the royal-nationalist faction are true, then he will spend much of his time from now on looking over both shoulders. The junta and its assembled technocrats seem poorly equipped to handle the complexities of administering the country, particularly the economy, and Thais with local grievances have shown they are not afraid to stand up to them when necessary. And although criticism from abroad can sometimes provoke a nationalist backlash, its accumulative effect does put pressure on the junta, adding to its list of woes. The next few months leading up to the referendum on the constitution will be challenging for Prayut. Despite the oppressive atmosphere in which the referendum will take place, it is unclear whether or not the junta-backed draft will actually pass. After seizing power, the junta pledged to completely reform Thailand but has thus far done very little of note. It seems strange that a military strongman with absolute power feels the need to gamble his prestige on a plebiscite, but that is what he has done — and if the constitution is rejected in August then General Prayut may find that his absolute power dissolves absolutely. James Buchanan is a lecturer and PhD candidate at the Department of Asian and International Studies, City University of Hong Kong. The generals want to be sure the opposition is eliminated before agreeing to hold elections.